Twitter chats are great engagement tools on social media. With your participation in each Twitter chat, you have an opportunity to learn new things, showcase thought leadership, get noticed by top marketing influencers, and grow your followers. But keeping a track of all the Twitter chats out there is a difficult task. 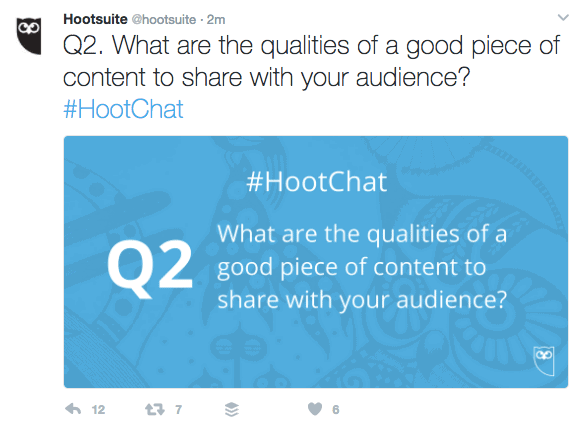 In this article, I’ve listed 25 of the best Twitter chats for marketers. If you’ve never participated in a Twitter chat before, don’t worry! Read the quick tips below to understand the basics of Twitter chats. A Twitter chat is where a group of users meet at a pre-determined time on Twitter to discuss a certain topic, using a designated hashtag for each tweet contributed. A host or moderator will pose questions to prompt responses from participants and encourage interaction among the group. Twitter chats usually last for an hour and most of them take place at the same time each week. 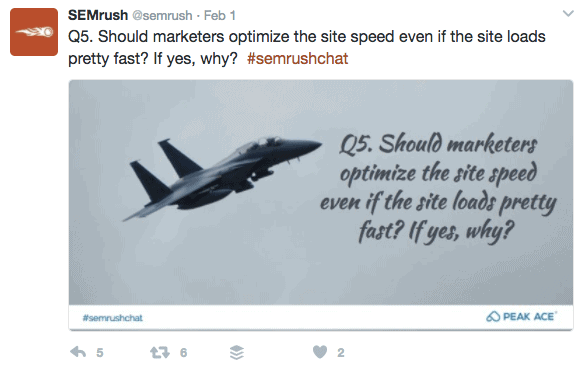 Why Should Marketers Participate in Twitter Chats? Twitter chats provide a unique opportunity to network and grow your professional circle through shared interests. Through Twitter chats, you hear about useful tools and tips and meet like-minded people whom you might not have otherwise connected with. 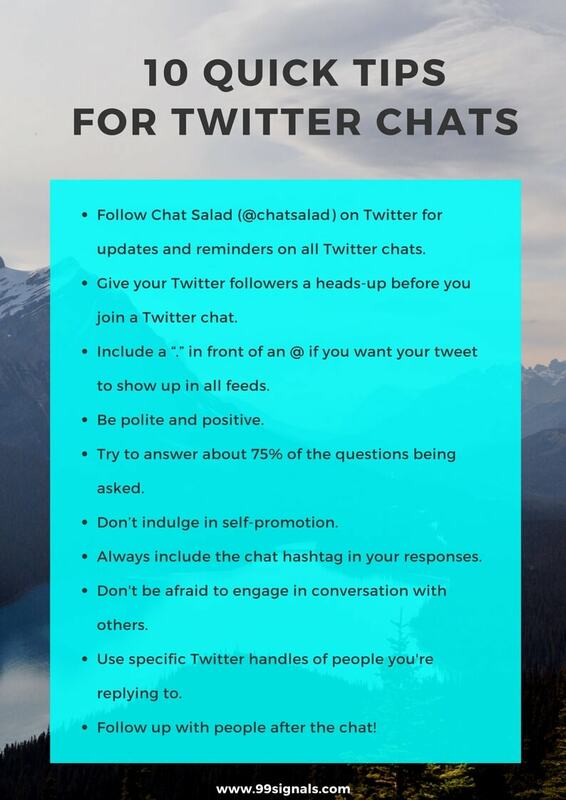 Follow Chat Salad on Twitter for updates on all Twitter chats and reminders before they start. Give your Twitter followers a heads-up before you join a Twitter chat at least 30 minutes before it starts so that they can be prepared for more tweets from your account aka “High Tweet Volume Warning”. Include a “.” in front of an @ if you want your tweet to show up in all feeds. Try to answer about 75% of the questions being asked. Don’t indulge in promotion of yourself or your brand. Twitter chats are all about learning and networking, not selling your product. Always include the chat hashtag in your responses. Don’t be afraid to engage in conversation with others. You should also quote, like, retweet, and follow others as appropriate, which will encourage them to do the same for you. When answering a specific question or comment from another participant, use Twitter handles to identify who you’re speaking to in order to avoid confusion. Follow up with people after the chat! Keep the conversation going or get to know fellow participants on a more personal level. You never know what new connections you can make! Here are the top 25 Twitter chats for marketers, listed by day of the week and time of day (EST). Founded by content marketing strategist Jenise Fryatt in 2013, #ContentChat is currently hosted by Erika Heald. It covers content marketing best practices and insights. When: Mondays at 3pm EST. This Twitter chat focuses on blogging best practices, blog promotion, tactics to increase traffic, and more. When: Mondays at 10pm EST. This weekly Twitter chat is hosted by Michelle Stinson-Ross and Alan K’necht and it covers all things social media. When: Mondays at 9pm EST. Founded by James Gurd and Dan Barker, this weekly chat focuses on e-commerce and digital marketing best practices. When: Mondays at 6am EST. This chat is hosted by Content Marketing Institute. It covers content marketing best practices, insights, and tips. When: Tuesdays at 12pm EST. Founded and hosted by Matthew Umbro, this Twitter chat covers PPC campaigns, keyword strategies, SEO tactics, and more. You can also get chat recaps on their blog. If you’re looking for ways to optimize your LinkedIn profile, then this is the Twitter chat you must participate in. This chat focuses on all things LinkedIn. When: Tuesdays at 8pm EST. Hosted by Hubspot, this weekly Twitter chat covers tips and insights on inbound marketing. When: Tuesdays at 1pm EST. Founded and hosted by ExpressWriters, this chat covers copywriting and content marketing tips. When: Tuesdays at 11am EST. This Twitter chat is hosted twice a week and it covers event marketing tips and strategies. When: Tuesdays at 8pm EST and Thursdays at 11am EST. 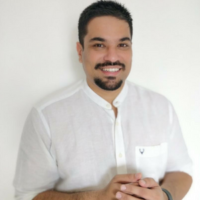 Founded and hosted by Paper.li, this chat aims to help businesses build communities for customers. When: Tuesdays at 2pm EST. This weekly chat is hosted by SEMrush and is one of the best chats to participate in if you’d like to learn more about SEO. Topics covered include SEO, SEM, landing page optimization, content marketing, and more. When: Wednesdays at 11am EST. Founded and hosted by Kristy Gillentine, this weekly Twitter chat focuses on best practices for Snapchat. When: Wednesdays at 2pm EST. If you are a social media marketing professional, then participating in #bufferchat is a must. This weekly chat hosted by Buffer focuses on a variety of marketing topics to keep the marketing pros hooked. You can also visit Buffer’s blog to catch recap of the chat. When: Wednesdays at 12pm EST. 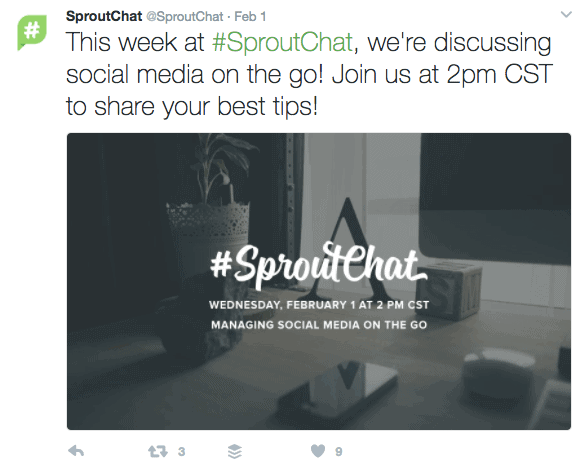 This is Sprout Social‘s Twitter chat and it covers best practices and insights for social media marketing. When: Wednesdays at 3pm EST. Hosted by a different moderator each week, this Twitter chat focuses on social media marketing and customer service. When: Wednesdays at 1pm EST. Founded and hosted by Kelly Lieberman, this chat focuses on Pinterest tips, best practices, insights, and more. When: Wednesdays at 9pm EST. This Twitter chat features interviews with experts and entrepreneurs on topics such as branding, business growth, management tips, and more. When: Wednesdays at 8pm EST. 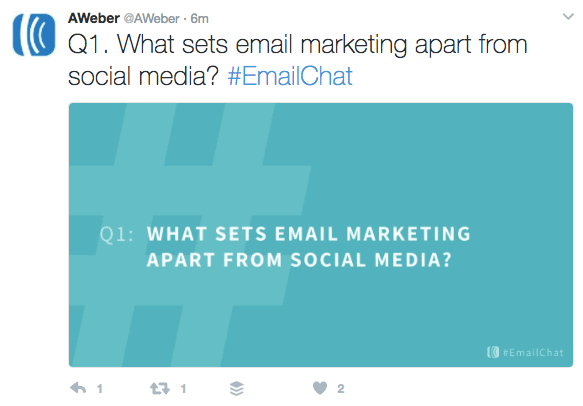 This Twitter chat is hosted by AWeber, and it covers email marketing best practices and insights, featuring a new guest host each week. You can find recaps of the chat on their blog. When: Every other Thursday at 12pm EST. This is a B2B marketing chat that covers topics such as demand generation and social media. When: Thursdays at 8pm EST. Hosted by Hootsuite, this chat covers social media marketing tips and strategies. When: Thursdays at 3pm EST. Hosted by Marketo, this Twitter chat invites influencers and brands to share their insights on a specific marketing topic. When: Typically on Thursdays at 1pm EST. 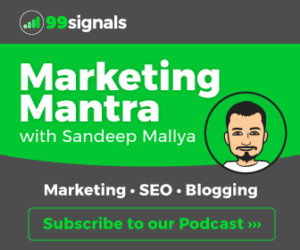 Hosted by Search Marketing Weekly, this chat focuses on SEO topics and is meant for SEO experts and enthusiasts. When: Thursdays at 1pm EST. Founded by Aaron Kilby, this chat focuses on online media and digital marketing best practices. When: Thursdays at 10pm EST. Hosted by My Community Manager, this weekly Twitter chat focuses on community-building and management. When: Fridays at 2pm EST. So these are the 25 marketing Twitter chats that you must participate in. 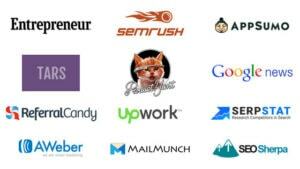 Did I miss out any of your favorite Twitter chats for marketing? Share your thoughts in the comments section. Wow, that’s enough chats to keep a calendar full! That tip #10 is an important one, “Follow up with people after the chat!” Using a Twitter Chat to make connections can lead to a really positive Twitter experience. By creating a scout for the chat’s hashtag on ScoutZen, you can get an automated list of participants to understand the community better. 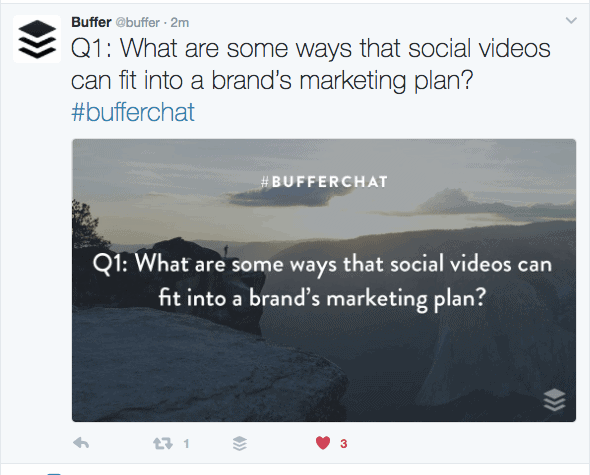 Thanks so much for including #bufferchat, Sandeep!